Access to my tried-and-trusted, verified vendor network complete with members-only discounts to all. You want to throw an amazing party that will appeal to quite a disparate group of people... and across the generations. But also, there is something within our community about creating huge weddings – the involvement of family, and the amount of money spent that is so much more onerous than other weddings and cultures. There are many conflicting pressures – the relationship, the money, the families, the spiritual aspect, the fact that you’re on show and your creativity and interestingness and fun-ness is up for potential scrutiny. Just imagine having all the tools, resources and support you need to plan your perfect wedding your way, whilst keeping everyone around you happy. No more feeling overwhelmed, no more feeling stuck in the middle of family dramas and not knowing what to do. No more wondering where to start, or what order to do everything in, or feeling concerned that you’re being ripped off, or wondering how on earth you keep everybody happy. You shouldn’t have to spend your time guessing, and trial-and-erroring your way to the best day of your life. And just imagine having immediate access to handpicked discounts and generous gifts from wedding vendors that I've personally sifted and sorted through to meet my rigorous standards (and yours). No more scouring the internet for the perfect wedding vendors, no more negotiating discounts with your dream vendors – I’ve done all the work for you. You deserve the resources, support, advice and negotiated discounts you need to ensure you have your perfect wedding, your way. Brides Club is the place to be for all the ‘Can’t Plan Without’ Jewish and interfaith Jew-ish wedding resources, support, straight-talking advice and handpicked discounts you need to ensure you have an unforgettable Jewish (or Jew-ish) wedding, whilst keeping everyone around you ‘on-side’. My secret community gives you access to my step-by-step advice, checklists, and resources for planning your perfect Jewish wedding, that not only saves you time and money, but also keeps everyone around you happy. For just $25 (or £19) a month you’ll receive weekly live Q&A wedding clinics with me, live masterclasses with trusted wedding experts, plus access to my tried-and-trusted, verified vendor network, 100’s of exclusive handpicked discounts, ‘What I Wish I’d Known’ interviews with Just-Married Brides, my ‘can’t-plan-without’ library of Jewish wedding checklists and resources (worth $197) and the emergency bridal hotline direct to me. I’m going to show you exactly to plan an unforgettable wedding, whilst keeping everyone around you happy AND save you time and money. There’s no commitment or contract when you join Brides Club. If what I’ve created doesn’t meet your needs you can cancel at any time. Full access to the step-by-step system for planning your Jewish wedding your way (whilst keeping everyone happy). ﻿So Karen, who are you? I’m Karen Cinnamon, the world’s #1 Jewish wedding expert and Founder & Editor of Smashing The Glass, the world’s biggest Jewish wedding blog. 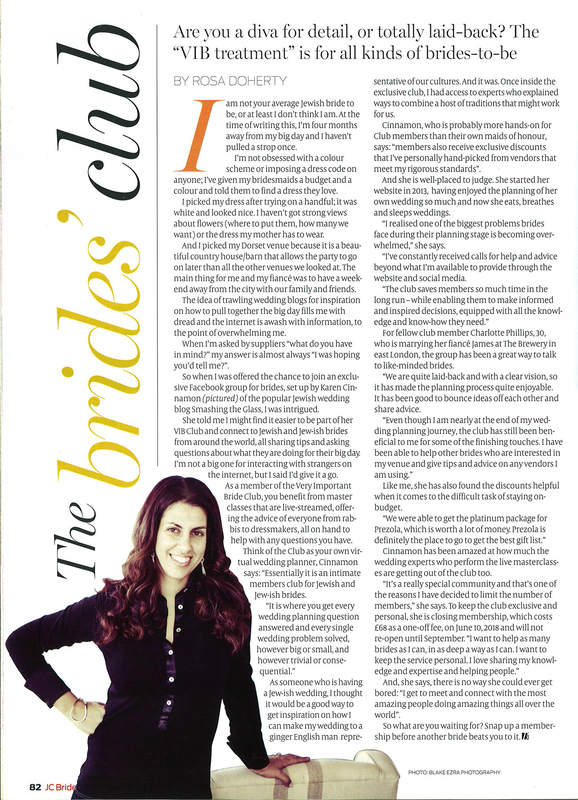 I’ve been there myself, planning my own wedding planning back in 2013, and subsequently helping 1000’s of Jewish and Jew-ish Brides as Founder + Editor of Smashing The Glass which I started just after I got married, over 5 years ago. Back in 2013, when I was preparing for my own wedding, it began to dawn on me that there was no single place that brought together creative, inventive and original ideas for style-focused couples planning their Jewish (and Jew-ish) weddings. The platform grew rapidly but the more it grew, the more I realised that a resource like Brides Club was needed to REALLY help Jewish and Jew-ish brides plan an unforgettable wedding whilst keeping everyone around them ‘on side’ and happy. Full access to the step-by-step videos for planning an unforgettable Jewish wedding (whilst keeping everyone happy). Full access to the step-by-step system for planning an unforgettable Jewish wedding (whilst keeping everyone happy).